On the New Year of 2009, Charles Koehly left this world, far to early. Since the early 1970's, this bold and dedicated entrepreneur developed a successful domain, representing the dynamic tradition of Alsace family estates. The house style is classic, crisp and charming. 1999 Altenberg de Bergheim has a big, generous aroma of lilic, petrol, honey, nutmeg and the inimitable scent of orange tree flowers. 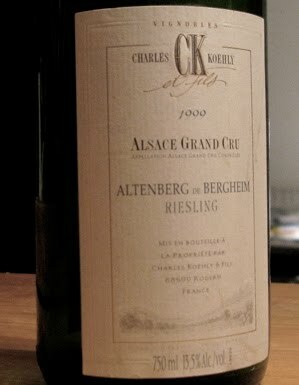 The taste is light, elegant and clean with a greenish, apply component that gives the wine freshness and personality. A wine that is truly French, the best mark a wine can get. Price: €11.50.